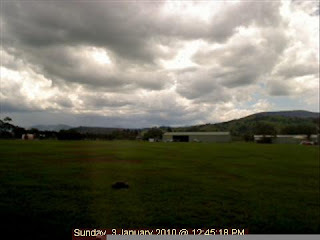 This is a webcam photo from the Boonah gliding club. I didnt bother going out today because of the forecast of rain and sure enough we had a downpour at 12.30pm. Almost every day of the Xmas and New Year we have had rain. In inland Australia they have had a lot more than here in Brisbane almost 300mm in 24hrs in some cases so the farmers there are really happy as it means a good crop at the end of the summer and a welcome break after years of drought. You never really appreciate how important rain is until you spend some time in Australia. In Europe it rains constantly throughout the year so there's always enough water but here in Queensland the rain falls in just 3 months and when it does it falls all at once so the dams have to fill to provide water for the rest of the year.